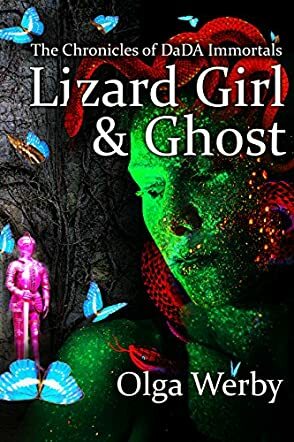 Lizard Girl & Ghost is a work of cyberpunk science fiction by author Olga Werby, and forms book one of The Chronicles of DaDA Immortals. In a fascinating and extremely modern rethinking of the Sleeping Beauty tale, we meet sixteen-year-old Jude in the real world, where she lies in a comatose state. Her father, unwilling to accept this, works hard to help her regain her conscious self by using cyber technology with her digital avatar, the title’s Lizard Girl. In doing so, he hopes that the development of Lizard Girl in the cyber world will help Jude’s damaged brain to patch and heal. What he really unleashes is a whole new consciousness where Jude lives in the digital space of the Far Cinct, and questions as to how separate it is, or could be, from its physical host. An extremely intelligent comic book come to life, Lizard Girl & Ghost, on the surface, tells an exciting and dramatic tale of illegal upgrades, hacks and life on the very edge of cyber crime. Alongside this is a very human tale of a father trying desperately to return his daughter to the physical world by augmenting her memories to live on in digital form. It’s this story line that gives way to a fascinating argument about the nature and future of virtual reality, digital consciousness and identity moving away from attachments to the physical body. Olga Werby should be highly commended for such a thought-provoking, exciting and well-developed piece of modern science fiction. Lizard Girl & Ghost: The Chronicles of DaDA Immortals is a cyberpunk science fiction novel written by Olga Werby. Aside from the early trauma of losing her mom when she was young, Jude’s childhood had been relatively idyllic. She was raised by her loving and devoted dad, who walked her to school through New York City’s Central Park and took her on vacations all over the world. She was sixteen now and just getting to the point where she could start accessing the cyber arcade on her own instead of under the supervision of her dad or the teachers at school. She even had a virtual date lined up with Dude, a kid from school, and had prepared for it with the help of her step-brother, Doc, who was younger than she was but way more experienced in the cyber world. So how did she end up horribly sick and entombed in a glass box connected to wires and tubing? And why was her dad looking as though she was at death’s door? This was definitely not how she envisioned the best years of her life to unfold. Lizard Girl & Ghost grips the reader and demands the "willing suspension of disbelief" so very powerfully. I had previously read Becoming Animals, which was co-written by Olga and her husband, Christopher Werby, so I expected that this book would be a memorable read, but I had no idea just how memorable an experience it would actually be. When I think of cyberpunk, I inevitably relive in my mind the awesomeness that was William Gibson’s pioneering cyberpunk masterpiece, Neuromancer. That book changed the way I looked at science fiction and revitalized the promise it held to the world. Lizard Girl & Ghost comes as close to that experience and that promise as anything I’ve read since. I loved the avatar Jude picks for herself -- big and strong and confident with snaky hair that communicates her feelings -- and I had the grandest time experiencing the cyber world through her's and her fellow avatars' eyes. And yes, I’m definitely looking forward to spending more time with Liz, Ghost, Doc and their friends. Even if you’re somewhat jaded by the science fiction genre, you owe it to yourself to try this outstanding read. I doubt you’ll regret it. Lizard Girl & Ghost: The Chronicles of DaDA Immortals is most highly recommended. All teenagers date in the cyber arcade, it is the done thing. Most just rent an avatar, but not Jude. Her step-brother guides her through the process of getting her own, and even adding some extra code to give her more of a presence. But perhaps the presence was too much, she attracted a lot of attention, worst of all that of her step-mother, now here she was. She was told she got sick, but she remembered all too well the sting of the pinprick from the device her step-mother had given her. While her body slips deeper towards darkness, her mind struggles to remain in the cyber world. Doc, her step-brother, and his friends are determined to find a way to save Jude, and if anyone can do it, it will be them. But in the vast cyber world things aren't always as they seem; then again, perhaps things in life aren't always as they appear either. Lizard Girl & Ghost: The Chronicles of DaDA Immortals by Olga Werby is an immersive and involved fantasy that touches on the realms of LitRPG in a very subtle way as we explore the cyber realm in which Lizard Girl, aka Jude, finds herself imprisoned as her fleshly body hangs on the precipice between life and death. I loved the surreal aspects of the cyber world, where there are sometimes literal visions for things, and other times a fairytale approach to events both in and out of this world. I enjoyed the language, both the commonplace and that inserted and added for the secret language of teens. I have to say I loved some of the unusual words, and perhaps I'm showing my age by not knowing a lot of them, but their meanings were made clear and the handy glossary at the back makes quick reference easy. I really enjoyed the author's writing style; this was a fun, entertaining and gripping read.